Barry Isett & Associates, Inc. is proud to be a part of the Lehigh Valley CANstruction initiative for the fourth year in a row, organized locally by The American Institute of Architects, Eastern Pennsylvania Chapter (AIA-EPA) and the Construction Specifications Institute, Allentown Chapter (CSI). The food used in these can-structures are donated to the Second Harvest Food Bank of the Lehigh Valley and Northeast Pennsylvania. This year’s theme was the “aCANemy Awards” and we chose to build a Moana display that had 8,940 cans alone. We're proud to announce that Team ISETT CAN! won 3 out of 5 of the awards this year; best original design, best use of labels and structural ingenuity-second year in a row! Thank you everyone who participated this year! Barry Isett & Associates, Inc. is proud to be a part of the Lehigh Valley CANstruction initiative, organized locally by The American Institute of Architects, Eastern Pennsylvania Chapter (AIA-EPA) and the Construction Specifications Institute, Allentown Chapter (CSI). The food used in these can-structures are donated to the Second Harvest Food Bank of the Lehigh Valley and Northeast Pennsylvania. This year's, Team Isett Can! - with the help of our sponsors - used 5,625 cans and 63 bags of rice for their "Comic-CAN" inspired structure. We are proud to report that we won the Structural Ingenuity Award! We're so grateful to have been a part of this volunteer challenge and to have been not only the Medium Company Winner, but the People's Choice as well. This was our second year back at the The Salvation Army, Lehigh Valley's Hospitality House shelter in Allentown. We were able to add to the gardens built last year as well as add a pergola, seating and additional landscaping. Special thanks to our sponsors Dan Schantz Greenhouse and Cut Flower Outlet; Dries Do it Center; our Isett volunteers and Volunteer Center of the Lehigh Valley. Through the generosity of all of the associates that donated and the company match of those donations, we raised a total of $977 dollars which gave us the top medium sized company award and possibly also the top donation amount among all companies. In addition, as each attendee entered the event, they were given one token to be used in voting for the top project – the People’s Choice Award, which we also won! However, the real big winner was the Volunteer Center itself and all the people and organizations they support. Through the sponsorships, the silent auction and the voting, it seems to have been a record year, raising about $40,000. 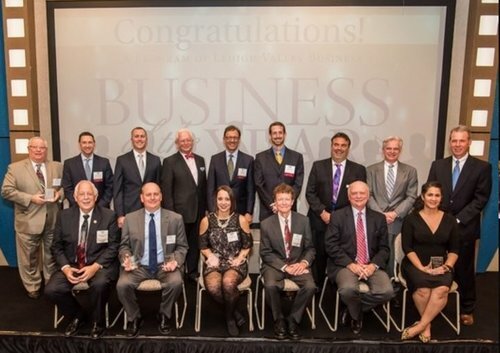 Barry Isett & Associates, Inc. was named “Business of the Year” in the 101+ employee category at a celebration organized by Lehigh Valley Business and attended by over 350 business people. The evening event was held December 5th at University Center, DeSales University, an Isett civil and structural project. In 2016, the publication named Isett Corporate Citizen of the Year. The award recognized Isett’s community involvement; benefits provided to the community; community affiliations; and demonstration of sustained commitment to employees. Barry Isett & Associates, Inc. is multi-discipline, employee-owned engineering firm headquartered in Allentown with other Pennsylvania offices in Phoenixville, Doylestown, Hazleton, Stroudsburg and Wilkes-Barre.